In How to Ignore the Basics of Personal Finance and Still Become Rich I addressed those who say it’s “easy” to become wealthy if you have a high income. I pointed out that income and net worth are not correlated, as many assume. In other words, it does not mean you’ll be wealthy simply because you have a high income. While income certainly has a hand in net worth (and there is certainly causation) there are factors other than income at play. And if you want to wade through an IRS research paper on the subject, have at it. The main point here is that while a high income gives you the potential to create great wealth, it usually doesn’t go that way. I haven’t seen any evidence on why this is the case (other than over-spending) when it seems like a high income would almost guarantee wealth. Today we’re going to try and sort out the reasons with at least one group who generally earn very high incomes and yet are notoriously low-wealth compared to those incomes: doctors. How many times have we heard the story of the famous professional athlete or entertainer who has declared bankruptcy? Here’s an example: Curt Schilling – who earned over $119 million during his famous baseball career – declared bankruptcy after losing money with a bad investment he made on a video gaming business. Other high-earning celebrities to file for bankruptcy include Mike Tyson, MC Hammer, and Elton John. This story is pretty common. In fact, Sports Illustrated found that 78% of NFL athletes have declared bankruptcy or have come close due to financial stress. Yet, the recurring story never ceases to make us ask, why and how? My athletic skills peaked during my division II college soccer career. So, I cannot relate to these aforementioned celebrities in terms of talent. However, as a high-earning physician, I can relate to these athletes as a high-income earner who is surrounded by people who are failing to meet reasonable financial goals. In fact, 25% of physicians over the age of 60 do not have $1 million in net worth. Some number greater than that (~25-50%) cannot retire despite earning millions of dollars over their thirty year medical careers. In this post, we will spend time outlining five reasons why high-income earning physicians often have a low net worth. We’ll also discuss possible solutions to each issue. Hopefully, this cautionary tale will help others avoid many of the financial mistakes that my crowd often makes. Imagine a world where for 11-15 years after high school borrowed money never needs to be paid back. This is how it works for physicians who go through four years of undergrad, four years of medical school, and three to seven years of residency/fellowship. At some point during this decade and a half long journey, all of the money being borrowed feels no more real than the money you use to buy Park Place and Boardwalk while playing Monopoly. This problem leads to two very dangerous behavioral finance problems. The first is that borrowing money no longer seems like a big deal. Everyone is doing it. In fact, 75-80% of graduating medical students have student loans. The average student loan debt burden hovers right around $200,000. When you are in this deep, what’s another $10,000 in debt? It’s just a drop in the bucket, right? The second problem this very long road creates is this imaginary life that is too far away to feel real. Someday, each of these students will make between $125,000 and $500,000 annually. This creates a false sense of security. It’s easy to think that their future-self won’t care about a little more debt when they make that much money! Both of these problems lead to an accumulation of often unnecessary debt that could have been limited during training. This problem can be remedied in two ways. First, medical students and residents need to be shown the math. Student loans compounding between 6% and 7% will double in about ten years. So every $1 now really costs $1.50-$2.00 once it is paid back. Limiting the debt matters. Second, examples need to be provided of the attending physicians that are 5, 10, or even 15 years out and still paying off their student loans. Just because their income is high doesn’t mean that student loans fail to exist. It’s not just Monopoly money to these people. It is very real. I’ve written extensively about the road to burnout and how it has helped me find my purpose in writing on The Physician Philosopher. The truth is that while the debt burden mentioned above accumulates, we are still training to become physicians. The road in training is brutal as we often see and hear many things that most people are never meant to experience. If we did the math – and, let’s be real, we do the math – the hours during training usually result in an hourly rate that is less than minimum wage. Taking all of this into account, we look forward to finally finishing training and becoming that high-income earning medical professional. It is the light at the end of a tunnel. A tunnel that we have been in for 11-15 years! The problem is that the light rarely ends up being quite as bright as we anticipated. Burnout has become a massive problem for doctors. Physicians struggle with electronic medical record requirements, loss of autonomy, administrators, regulations, decreasing reimbursements, and declining patient satisfaction that they can do little about. In fact, a recent survey showed that 42% of all physicians are burned out. 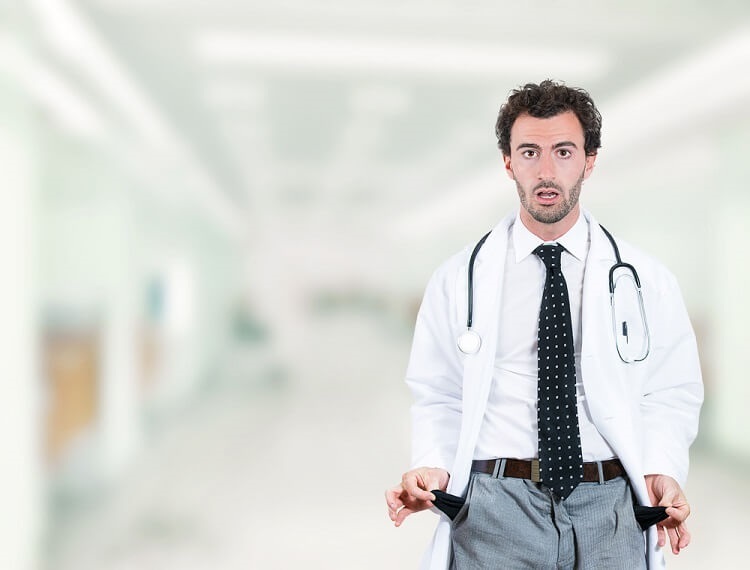 All of this results in one fundamentally bad financial behavior when doctors become attending physicians – they try and spend their way to happiness. They buy the big house, the new car, private schooling for their children, and designer clothes and gadgets. Only later do they realize that none of these purchases provide any meaningful or lasting happiness. The financial problems compound as these doctors now get to combine these poor financial decisions with hundreds of thousands of dollars in student loans. 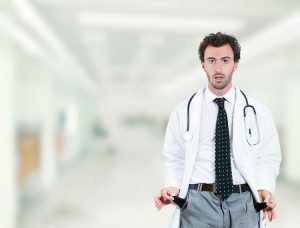 Further entrapped in debt, many physicians can’t find a way out – which likely explains why surveyed physicians listed finances as the number 2 cause of depression for doctors. It may surprise many of you that around 400 physicians die by suicide each year. Spending money does not solve any of the burnout or depression problems experienced by physicians, but that doesn’t stop any of us from trying. However, it does prevent doctors from using their income to build wealth. Physician burnout is a complicated and ugly monster that needs to be slayed. Yet, listing all of the possible solutions to burnout is beyond the scope of a single guest post. What can be said is that the answer to the financial aspect of the issue is that people of all kinds need to learn the art of contentment. More money and more stuff typically do not make people happier, particularly high-income earners. Learning what “enough” means and then using any additional money to build wealth would go a long way towards achieving financial independence, which provides options for burned out doctors – including the ability to go part-time or to leave medicine completely. With all of the financial problems that exist in medicine, you’d think that business and personal finance would be mainstays in the medical school curriculum. However, this couldn’t be further from the truth. One paper showed that more than half (58.8%) of the resident physicians surveyed thought that an organization existed that would protect them from losses in the stock market. Only 13% understood the definition of a “no load” mutual fund. The poor financial literacy is perpetuated because most academic attending physicians view personal finance like an Old Testament leper. It’s just too taboo to talk about with their trainees. Instead of doing the right thing and teaching about their own financial mistakes, they would rather ignore the topic completely. The time is near where this problem will be fixed. Too many of us are starting financial curricula of our own to remedy this problem – while we call out the other attending physicians to do their job and start teaching this topic, too. However, until a business of medicine curriculum exists at each medical school, the abysmal financial literacy among physicians will prevent these high-income earners from amassing a corresponding high net worth. Being a high-income earner of any kind carries particular expectations. These can be self-imposed or placed on us by society. Either way, people have certain ideas of what it looks like to be a physician. We live in a certain kind of house, drive the right kind of car, and educate our kids in the right institutions. This produces a noteworthy amount of entitlement for physicians who expect to act the part when they finish training. They’ve worked hard to get to where they are as a doctor. Therefore, they deserve all the nice things that they’ve put off for so long. Naturally, all of this creates a spending problem designed to keep up with the other Dr. Joneses who have a very expensive (and public) lifestyle accompanied by their very low (hidden) net worth. Given that money is too taboo to talk about, our students do not know about Dr. Jones’ low net worth. All that is seen is the outlandish lifestyle, which perpetuates the bad example and expectations for the future generation of doctors that Dr. Jones’ teaches. Fighting Dr. Jones will require a herd mentality and education. The more acceptable it becomes for high earners to live a life of relative frugality, the less tempting it will be to keep up with the Dr. Joneses. Progress will be made through good examples of physicians who have simply said no to lifestyle inflation after training. We need good examples who teach that it is not only acceptable – but advisable – to live within our means to enable us to achieve our financial goals. With more education, we will no longer feel envy for Dr. Jones. We will feel pity as we realize their unwealthy and unhealthy situation. The last reason that high-income earning physicians fail to achieve a high net worth is that we tend to be easy financial targets. We are a bunch of gazelles running in a field full of lions. These lions are called fee-based financial advisors and insurance salespeople who view doctors as an easy way to put supper on the table. This post has already outlined the low financial literacy and the societal expectations that are placed on doctors. It should come as no surprise that the financial industry is acutely aware of this, too. Couple that with a trusting nature and a high income, and the target on our backs might as well be brushed in neon paint. For example, let’s look at whole-life insurance. The typical whole-life insurance policy (which is the wrong kind of life insurance for 99% of physicians) pays a handsome commission to the insurance salesman selling the policy. In fact, 50-110% of the first year’s premium goes straight into the pockets of the insurance sales person. So, for a policy with a $20,000 annual premium, that’s usually going to result in the same amount in earned commission in the year it was sold. If the insurance sales person sells ten whole-life insurance policies with the same value, that’s a $200,000 in annual salary. Not too shabby. Unfortunately, it’s also not too hard to convince financially illiterate physicians that this is a good idea. Gazelles and lions. It’s really that simple. The fix here is a bit more complicated. The financial curriculum that was alluded to above will go a long way. However, the financial industry does an excellent job of preparing their people to sell products. The best way to prevent doctors (and anyone, actually) from getting fleeced is to produce as many do-it-yourself investors as possible and to teach the others exactly how to find a financial advisor that is worth using. The gold standard of financial advisors has been defined for those that need one. Hopefully, this post helps make sense of the plight that is being a high-income earner with a low net worth. Many of the problems are self-inflicted, while others are caused by a medical education system that hangs their graduating doctors out to dry. The take home is simple. No matter how well you throw a baseball, sing a song, or take care of patients – a high income does not guarantee wealth or a corresponding high net worth. Thanks for the opportunity, ESI! This is a really important topic – separating the ideas of wealth and income early on are crucial to financial success. Looking forward to seeing what others think. The Whole Life Insurance industry is sad! I’m not sure how sales people sleep at night…probably with a stack of dollar bills as a pillow. Thanks for the insight into the perils of high income earners, being a doctor does not automatically get you a financial education. It’s an area I hadn’t thought much of, I’m starting to work with middle income earners and they are fleeced by the whole sale life insurance industry as well. In New York, lawmakers require the original whole life sales person to be notified if their customer is canceling and getting a term insurance product so they have an opportunity to “resell” their product. Lobbyists won that battle again, and the consumer is left holding the bill. I’m working to educate my friends and family one by one. Wish me luck! 🙂 Great article, crazy statistics for the student loan debt, thanks for sharing. As a landlord, I can vouch for the student loan debt. Have rented to my share of lawyers and doctors (and always verify financial info), and $200K is the minimum… sometimes its upwards of $300 – $400K if they are coming out of the top schools. Insane!!! And I get to see lots of rental applications (many of which are rejected). In order to rent in my property, an minimum income of $140K is needed. Universally, I am shocked by income vs wealth disconnect. Admittedly, since these folks are renting in an expensive area, it is a narrow sample – if they were wealthy they’d likely own rather than rent. And don’t get me started on long-term care insurance. Less prolific than whole life, but IMO a very expensive, massive rip off. MM, would love to hear more of your thoughts on this as LTC has been something I have been thinking about lately and whether or not it is worth it. I’ve had a running debate on this topic with my planner for years on this question and we have agreed to disagree on this one. Of course, I believe every financial & insurance product has an appropriate role for the right person and the right circumstance, so note to self: Avoid making blanket statements! 1) The costs are high, very high, and the benefits are pretty low by comparison – most policies seem to only cover 2-3 years of care and do not cover the full cost. Years ago, in another career, an insurance executive explained to me that a very high % of people die within 2 years of entering a nursing home – they are counting on that fact. Dementia may be the exception, but personal experience has shown me that even with dementia life expectancy is fairly low, once placed in a facility – quality of care simply is not conducive to life expectancy even in the best places. A close friend had a LTC policy, was placed in a nursing home, and sure enough passed away well before they could come remotely close to recouping the premiums they had paid out over 20 years. And that fact isn’t keeping this insurance company from disputing a sizable chunk of the benefit claims. Only one example, but illustrates the cost/benefit problem. 2) Counter-party risk. There is no guaranty that an insurance co will be around and capable of fulfilling its obligations decades into the future. Furthermore, insurers can sell their portfolios to other insurance companies, so again, even if you start out with a really strong, highly regarded company, you could end up with a really crappy one down the road. This happened to a family member with respect to an annuity – the new insurer is far less creditworthy and a nightmare to deal with. 3) Upfront and/or ongoing premium payments for a benefit you may not need until many, many years down the road works against you. Human nature is that after you’ve paid in many thousands of dollars in premiums, if you decide this is a bad deal down the road or just cannot afford the premiums anymore, you are incentivized to keep throwing good money after bad. 4) Potential for premium increases. Insurers have often underestimated the costs associated with this business. Increases have to be approved by regulators, but if faced with a choice of allowing an industry to go under and bankrupt the state’s insurance reserve fund, or allowing massive increases in premiums what do you think the regulators will do? 5) Qualifying for benefits is not necessarily simple or easy – say for example, you need a home care aid, you’ll be subject to various tests and standards before they will begin paying benefits. And pre-existing conditions are typcially not covered (so there is a nice grey area of what exactly is causing the difficulty). Those are the issues that come to mind – I’m sure I can think of more later. I believe there are lots of other ways to plan for aging. This is going to become a massive problem for our society down the road as the boomer bulge ages, and there will have to be governmental solutions – we just don’t know what those solutions will be yet. Meanwhile, i am not willing to sign up and prepay for a crazy expensive product that might not even be relevant in 20 years when I might need it. Very good comment MMiguel. I’m with you on every point regarding the LTC insurance industry. And these days it seems by the time a person actually has a policy claim to make (LTC as well as others types of insurance), instead of the company honoring the contract, the customer may very well have to hire a lawyer to get the insurance company to honor their end. FYI, with a bit of googling, I found this: The mortality rate for an individual moving into an Alzheimer’s care unit within the first year is greater than 50%. No doubt for a physical injury in an elderly person it is probably much worse. I think the aforementioned insurance executive actually said something more like 1 year (not 2 years) in terms of mortality – this was very many years ago so memory is fuzzy, but I recall being shocked at how short the life expectancy was and this has born out in my personal experience. I believe most people are interested in LTC insurance due to the worry about the high cost of nursing home care. But, I’ve observed that people will do everything possible to age in place – entry into a facility usually only happens when things have really gone south, making the length of stay relatively short. MM, thank you so much for your well thought out follow up. All of these are great points. I have yet to do anything but someone who I use sparingly for investment ideas did present me with an interesting quote from Lincoln Financial. We discussed a program where you put up 100K once to cover the LTC policy. If ever needed, it covers up to 6 years of monthly payments for LTC and begins year 1 at $3600/mo. which increases each year thereafter. It also has a death benefit that begins in year 1 at 175K and slowly declines back to 100K after 25 years and then fixed from that point on. You can get out at any time and the surrender value back to you is fixed at 80K, regardless of when you get out. The downside is you have to give them 100K up front but at least there are no other payments required and your beneficiary will get at least the initial investment returned upon your death and you always have at least 80K that can be returned if you ever needed to get out. The money made available to you for care on a monthly basis might not cover everything but it at least makes a decent dent if you ever needed it. At year 8 you are up to $5K per month coverage and by the time I turn 80, it would be $9K per month. I like things simple and this plan is by far the easiest to understand that I have seen and seems to have the best tradeoffs for the money. Of course, putting 100K down right up front would not be for most people but might not be a bad insurance plan for those who can afford to do so. LOL, after years of attempts at selling me LTC insurance, my planner presented me with something that closely mirrors what you’ve described. We have the cash, but the large upfront payment was just too much to stomach. It’s tempting, and maybe I’ll reconsider, but right now I’d rather invest the cash and take my chances. I do like the death benefit and surrender value aspects of it though. Unfortunately, my recent experiences thru friends and family with LTC insurance have left me very cynical – it’s all promises and warm commitments when they’re selling this stuff and then they use every friggin loophole and fine print clause in the book to keep from paying out. Makes me feel its like playing poker with the devil – and the devil in this case is a lot more clever, resourceful, and ruthless than we are. I’ve had a planner I work with and my Merrill Lynch guy both present the same proposal without knowing about each other. It must be the new “IT” program for LTC. I agree with you on the concerns over getting the money when you actually need it. That is a major reason for pause for sure. One last thing – these hybrid policies are essentially life insurance policies with a LTC rider attached. I have not down an analysis, but have a sneaking suspicion that the hybrid policy is more costly than if you acquired these two components separately. I’ve never had anything to do with retail insurance, but from past experience with institutional financial products, I can tell you that where the most $$$ was made was when salesmen could package two or more products into a blend of features and rearranged payment schedules to obscure the true costs and profits. I always wondered why physicians had such a terrible reputation as financial train wreaks… now I know. In all fairness, most high-income professionals are prong to some amount of hyper-consumerism and over-spending, but I guess the difference is that with some of the other high-income professions, an element of business and financial education & training tends to be part of the job requirement (Wall St bankers, corp lawyers, CEO’s, Big 4 accountants, entrepreneurs, etc.). Personally, as a “high-income” earner, I have found that the volatility of my earnings (i.e. bonus, commission, deferred comp, stock options, type income) forced me to think, live, and plan on a lower income level than I ultimately received, which greatly improved the ability to save (as long as don’t go wild in good years). Could it be that a high, steady, predictable income leads to greater temptation of lifestyle inflation? In my case, it probably would have and maybe this is part of the physician curse. Possibly. Though we receive bonuses, too, depending on the job structure… And I’ve seen people make the same financial mistakes in this situation. I worked very closely with hundreds of physicians over my entire career as a hospital administrator. . Mostly (95% or more of physicians) are good, genuine, caring people trying extremely hard to help people. But, yes, financially very under-educated as a whole. And the whole gazelle and lion analogy – right on. Then without knowledge of who to trust, they make uneducated, off the hip bad decisions, or just retract and trust no one (most often). The ones that get hurt the most are usually the arrogant ones who think they know, they make really bad investments, and they find themselves working at 65 and 70 because they have to. Example – one CT surgeon friend who made well over a million a year for 20 plus years has literally nothing………and has to work to this day (he is around 65) because he has no assets. It’s truly unimaginable to me……….but it happens ALL the time. What you wrote here is right on point. Thanks. I’ve seen it happen quite a bit myself, and the stories of bad interactions between lions and gazelles are almost too numerous to count. Thanks for your thoughtful comment. Hopefully, soon, poor financial literacy among physicians will be a thing of the past! I bought a Mercedes, 2 homes (in residency) and another home (my current one) when I finished residency. All banking on future me to pay it off. The amount of interest I paid on my student loans is staggering (graduated with around 160k in 1997, paid it off 17 years later). There is a culture shift now as physician bloggers are starting to add their voice to the fray, but I think we all are a little biased because our audience tends to be the docs who get it while the vast majority of docs are still out there trudging along with ignorant bliss. Financial literacy should be a required class in high school, college, medical school, and residency. I went through 26 years+ of schooling and not one hour in finance. Insane. Hopefully the space will become so occupied with voices that people will have to willingly ignore the topic. Pretty soon, people like you and I won’t give them a choice! Don’t forget that taxes also take a huge amount off the top when you have a high salary especially where we live in New York.. I am married to a physician making a high income and retiring in two years. We have a decent net worth because we live in a low cost of living area , so geo arbitrage has played a part. Also there are not that many JONES types to keep up with here so we never entered that race. We drive our cars for 10 years, don’t own a second home and really don’t travel that much. We are also not big spenders and managed to save about 35-50% of take home depending on the year and if we had college tuition payments. Our biggest extravagance was cash flowing college expenses for three children and now tuition and living expenses for our last child attending medical school. My husband never had student loans and we want our son to finish med school without debt as well. I am constantly drumming the savings/frugal mindset into him as well. So it seems we have managed to avoid many of the problems mentioned in this post. Now hopefully we can spend a bit more in retirement! Oh one more point- we have lived in our one and only home for 30 years-did updates but avoided upgrading like a few of my friends have. Paid house off after 17 years and that was it. Family physician and wife is a pharmacist, mid 40’s. God willing, we have an upcoming MI-119 interview. Net worth 8 figures, annual income 7 figures. It is by no means the physician or pharmacist in us that got us here. Nor is it the lawyer, engineer, athlete, celebrity, inheritance or lottery that gets people to financial independence and keeps them there. It is the ENTREPRENEUR in those of use who choose to discipline ourselves and take the time to learn (financial literacy) that leads to steady, strategic advancement in our ESI over the decades leading to retirement. It is the entrepreneur that understands the power of compounding and networking, the balanced tolerance and diversification of risk, the torment of bad debt and depreciation, corporate manipulation by a constant barrage of advertisement promoting the accumulation of things, the laser focus needed to achieve our goals, the avoidance of disguised schemes, the value of state university for most career paths, the power of using other people’s money and time for our benefit, and the importance of pursuing our passions so we can enjoy the journey leading to the destination without the specter of burnout. The physician is generally stubborn and “smart” whereas the entrepreneur absorbs every opportunity to learn what to do and what not to do from anyone and any experience, positive or negative. In parallel, it is the GODLINESS in people that leads us to pursue helping others as the primary objective that leads to the wealth building and avoidance of burnout, the importance in keeping our focus on marriage and family that leads to stability, the understanding that our talents are not our own and should not be hidden under a rock, and that lets us understand we get back 100 fold what we give. I am personally a firm believer that without this, the entrepreneurship alone wouldn’t have worked out for us. It is also this that tells us some necessary decisions are sometimes bad financial decisions and, other than for security, money is low on the priority list of life’s journey. For example, I read one may be financially better off without children, but I personally have never entertained this thought as it would have taken away the greatest joy in my life. It is the Godly that prepares a path forward in terms of eternal treasure, the entrepreneur that prepares a path in terms of years or decades for security, but the doctor likely thinks in terms of today or tomorrow to “enjoy” a good salary. And you don’t have to give up the here and now to get there in retirement. We have the sports cars, the big house, and so forth (bought those years ago, now my dream is a small condo and and old but reliable beater, by choice). But you do need that voice in your head to keep you mindful of the NEEDS of your future self to balance the EXCESS WANTS of your current self. You can become the Jones if you don’t try to keep up with the Jones when you are not the Jones. Believe me, if I can do it, it’s not that complicated. You just have to want it for the right reasons. And there are clearly many who have accomplished much more than we did. In the information age, all the tools are available to all. It’s ours for the taking – higher and lower earners alike. Some may say it’s easier as a high earner. That’s usually correct. However, I became a high earner (by most measures) by implementing my discipline three decades ago as a near minimum age earner. That’s how it works folks. Don’t be the high earner just spinning their wheels because you didn’t take the time to learn and implement. I wish for greater financial literacy for my physician colleagues – hopefully over time more of us will stumble on this and other great reads before the burnout becomes too much to bear. I feel like this comment could have been a TED talk! I agree that without the right perspective, very little can be accomplished that is meaningful. Hopefully, the voices in this space will grow to a loud roar. I’m surely going to do my part to make that happen! Very well stated, and I look forward to reading your interview in a few weeks! Perfectly captures the tension of delayed gratification which is so essential to living well and wealthily! On average, I think it’s still easier for higher income people to accumulate higher wealth because they have more choices on how to spend money. If you only make 20k a year, you definitely won’t be able to save much even with a frugal budget. High income earners have the opportunity to save a lot with the right attitude and education. Nevertheless, this is a very insightful post and I agree with many parts of it. Student debt is truly evil. Coming from an expensive business program myself, I have seen how student loans get people used to spending on experiences they otherwise wouldn’t be able to afford because “it’s just another 10k on top of my 100k loan”. Once you already spent like a king as a student, it’s difficult to become frugal when you graduate with a high-paying job.